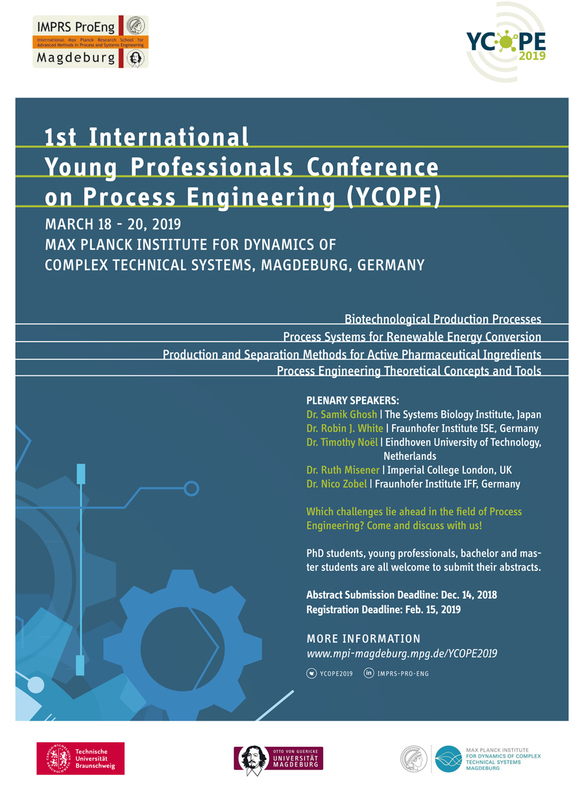 The International Young Professionals Conference on Process Engineering YCOPE 2019 is an initiative of PhD candidates of the International Max Planck Research School ProEng. YCOPE 2019 brings together students, experienced opinion makers, young and experienced professionals and innovators to discuss future aspects of Process Engineering and new opportunities to strengthen the connection betweenacademia and industry. As synergies can be obtained on theoretical, algorithmic, and even software-related areas, we are interested in fostering exchange, thus, paving the way for innovation out of apparently unrelated areas. Dr. Seyed Soheil Mansouri, Technical University of Denmark, Lyngby, Denmark. The event is organized jointly by the International Max Planck Research School for Advanced Methods in Process and Systems Engineering (IMPRS ProEng), Max Planck Institute for Dynamics of Complex Technical Systems, Otto von Guericke University, Magdeburg and Institute of Energy and Systems Process Engineering, TU Braunschweig. PhD candidate? Young professional? Innovator? Experienced researcher? Curious student? Come discuss the future of Process Engineering, and explore the intersections between academia and industry with us at the Max Planck Institute Magdeburg! The participants are invited to submit a full article in the special issue of Processes. Looking forward to meeting you in Magdeburg!